Wroclaw, Poland, 2017-Oct-25 — /EPR Retail News/ — AmRest Holdings SE („AmRest”) (WSE: EAT), the largest publicly listed restaurant operator in Central Europe announced an opening of the first blue frog restaurant in the Polish market. As a result, the Company expanded its operation in the Polish market, where already was present with five brands of Quick Service and Casual Dining Restaurants. Entering the polish market is a natural sequence of brand’s expansion in the world. The shape of Polish gastronomy market and customers’ openness to new concepts are creating a big chance for us to grow. We have five years of experience in running blue frog business in China and we hear positive opinions about blue frog in Spain, where we’ve just opened the first blue frog restaurant. We believe that the idea of contemporary American kitchen with Asian accents will meet customer’s expectations in Poland – said Sylweriusz Faruga, President of blue frog. 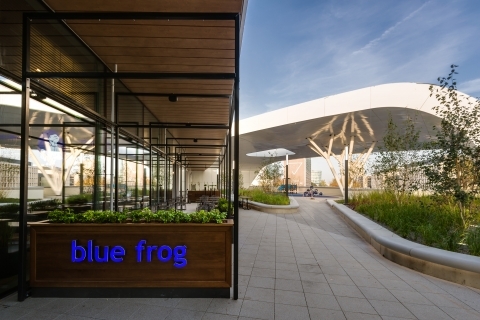 The first blue frog restaurant is located in a newly opened shopping mall Wroclavia in Wroclaw, Poland. The Company plans to develop the blue frog brand in the biggest polish cities. Blue frog’s history within AmRest started in 2012, when the Company purchased a majority stake in Blue Horizon (running at that time 10 blue frog restaurants in China). Since 2012, AmRest has expanded the brand to over 40 new restaurants. In 2017 the Company begun an expansion of the brand in Europe. The first blue frog in the Old Continent was opened on September 18th in Parquesur, the largest shopping, leisure and catering center in the Community of Madrid and one of the largest in Spain. Poland is the second country in Europe where this unique brand debuts. The newly opened blue frog restaurant in Poland marks another milestone in AmRest history, being the 1500th restaurant in the Company’s portfolio. This entry was posted in Business, Food & Beverage, Management, Restaurants, Retail, Retailer and tagged AmRest Holdings, blue frog restaurant. Bookmark the permalink.